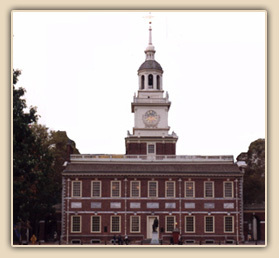 Independence Hall was constructed in the 1730s, and its Stair Tower was added in the 1750s. Known as the Pennsylvania State House, it was the site of the early planning and establishment of the United States of America in the mid-to-late 1770s. The building is owned by the City of Philadelphia and underwent a major restoration directed by the National Park Service between the 1950s and 1970s. The restoration period of the building is 1776-1780. In the early 1990s, the National Park Service engaged the services of Welsh Color & Conservation, Inc. to collaborate with Mrs. Batcheler in reevaluating the original colors of the building. The results of the joint investigation and analysis closely matched those of the earlier efforts. This campaign of finishes analysis was then incorporated into a broader study of all of the Independence Square buildings by a local architectural firm. During a major utilities upgrade of the buildings, the interiors of Independence Hall, Congress Hall, and Old City Hall were repainted using the reevaluated colors documented by Welsh Color & Conservation, Inc. 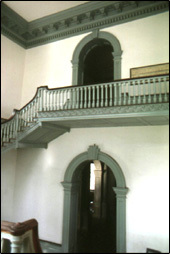 Above are two photographs of the restored interior of Independence Hall. 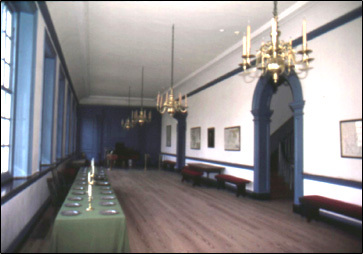 The image on the left shows the Long Gallery and the image on the right displays the Tower Stairhall.